Precision Stainless Steel Coils With Good Quality And Competitive Price. China.it Is One Of The Leading Companies Specializing In Producing And Trading Stainless Steel,crystal Glass Ctafts And Filtering Cores. 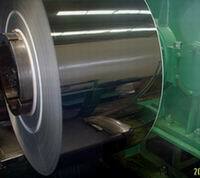 Trading,importing & Exporting Stainless Steel Sheets/coils,stainless Steel Products. Trading,importing&exporting Filtering Cores,filtering Cores Component,electronical Component,etc. Established Early In 2001,our Own Stainless Steel Factory Is One Of The Largest Stainless Steel Enterprise In China.it Gets The Raw Material From North Taiwan, And It Has The Worldly Advanced Production Line. We Can Offer High Quality Stainless Steel 2,500mt Monthly,and 18,000mt Yearly. The Factory Has Two Cold Rolling Mill Lines Presently,including Cold Rolling Mill, Vertical Bright Annealing Line,horizontal Heat Treatment Furnace And Skin Pas Mill.to Meet The Needs Of Various Of Firms,there Is One Large-sized Slitting Line And Numbers Of Small-sized Slitting Lines,cut-to-length Lines And Leveller-cutter Lines In The Plants.as Well As Large-scale Minute 1 Set With Other Advanced Necessary Equipment,engineer 5,technician64,and Over 300 Plant Workers. Quality Is Our Main Concern And We Produce All Our Products As Standard Norms. At Present,our Stainless Steel Is Being Used Widly Inland,and Exported To Europe,the Middle East,southeast Asia And Other Countries And Regions. And Stainless Steel Trading&exporting Becomes Our Main Business.